badam halwa is a rich south indian style delicious halwa made with blanched almonds, ghee and sugar. soak ½ cup almonds in 1 cup boiling hot water. cover and blanch the almonds for 30 to 45 minutes. if you want, you can even soak the almonds overnight in water. also soak ⅛ teaspoon saffron strands in 1 tablespoon warm or hot water. drain the almonds of all the water. now just press each almond and the skin comes out easily. peel all the almonds this way. now add the blanched and peeled almonds in a grinder or blender. add ⅓ cup water and grind the almonds to get a fine rava or sooji like consistency. grind in parts or you can use the pulse option in the grinder. grind for some seconds, scrape off the sides and add unground whole pieces of almonds in the grinder jar. this way grind till you get a rava like consistency in the almond paste. do not make it too fine. heat a thick bottomed pan and keep the flame to a low. now take of all the almond paste in a pan. scrape of the sides as well as the bottom jar with a silicon spatula or spoon to get the almond paste. continuously stir the almond paste and cook it for 2 to 3 minutes till you get their aroma. then add ½ cup sugar. with a spatula stir very well, so that the sugar is mixed evenly with the almond paste. the sugar will start melting. keep on stirring and cook this mixture. the mixture will thicken and start to come together. after adding sugar cook on a low flame for 5 to 6 minutes. now add the soaked saffron solution. mix it very well. now we will begin adding ghee in batches. first add 2 tablespoons of ghee. stir and mix it very well. 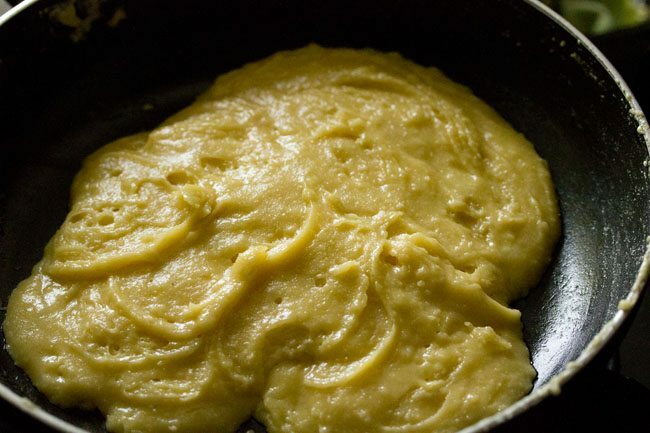 cook till this ghee is absorbed by the halwa mixture. now add another 1 to 2 tablespoons of ghee. again stir and mix it very well, till all the ghee is absorbed. this way keep on adding ghee in batches. do cook the halwa on a low flame. after adding ⅓ cup ghee in batches, keep on stirring the badam halwa and cook till the mixture thickens. do stir often. the badam halwa will thicken and begin to leave the sides of the pan. you will also see holes in the halwa, when you stir it. stir and cook till the halwa starts lumping around itself and leaves the sides of the pan. here is a pic of the badam halwa almost done. just 1 minute before i switched the flame off. to test take a tiny portion. its hot so be careful. let it cool a bit and form into a ball. it should form a smooth soft ball and not be sticky or wet. it took me 10 minutes to get the right consistency of halwa after adding ghee. switch off the flame once the badam halwa is done. pour all the halwa in the container and then let it set. you can then scoop out the badam halwa and serve. or else you can spread badam halwa on butter paper. fold and then serve when cooled. 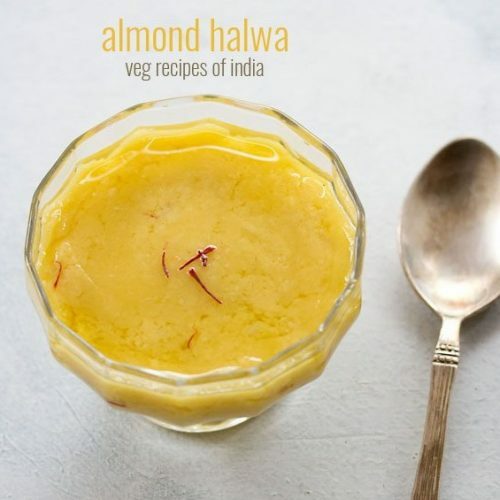 serve badam halwa warm or at room temperature. this halwa stays good for 3 to 4 days at room temperature. you can also refrigerate it. please use a heavy pan or kadai. cook the badam halwa on low to medium low flame with continuous stirring.